If dreaming up over-the-top top menu items that straddle the line between delicious and unholy were an art, KFC would be the Dalí of the fast food world. From the beloved and bun-less Double Down sandwich to fried chicken crust pizzas, the chain has quite a track record when it comes to bringing beautifully strange offerings into the world. 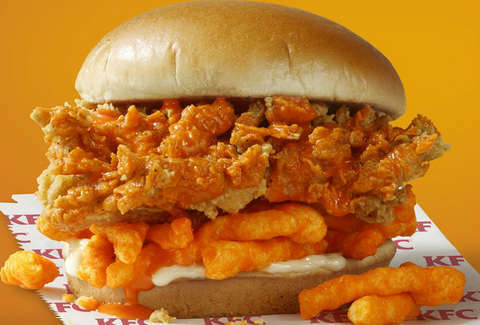 However, we'd be lying if we told you we weren't particularly excited about KFC's newest concoction, the Cheetos Sandwich, which not only comes stuffed with fried chicken and actual Cheetos, but is topped with a special "Cheetos Sauce." The new sandwich, which is currently being tested in select markets around the country, is essentially a regular Extra Crispy chicken sandwich with a few very important improvements. For one, it comes loaded with a generous layer of actual Cheetos and is topped with a custom Cheetos-flavored glaze, the latter of which remains somewhat of a mystery, but presumably packs an appropriately cheesy punch. And in case you were holding out hope there was some diet-friendly element, there's also a thin layer of mayo. Unfortunately for those of us with an appetite for heat, the Cheetos featured in this doozy aren't of the Flamin' Hot variety. KFC hasn't revealed any details on if or when these will be available more widely across the United States, but according to a spokesperson, they're being tested starting today in select locations in Virginia (Roanoke and Richmond), North Carolina (Raleigh and Greensboro), and Georgia (Greenville). So, if you have any pals in those areas, please beg them to stop by and order one, so they seem popular enough to take nationwide. Until then, the rest of us will just have to slum it by assembling our own DIY Cheetos franken sandwiches.